Our senior Company members will be performing in Spring Awakening and our junior Company members and students will be performing in Shrek! SAVE THE DATE! Audition details coming soon! Save the date for our Annual Showcase. Click here for more details. Please be advised we will be CLOSED for Spring Break from Mon, April 15th - Fri, April 19th. Parent observation week for all early childhood education classes (Dance Combo, Kids on Broadway* and HipKidz) will take place from Monday 3/25 - Saturday 3/30. Parents will have the opportunity to watch the last 15 minutes of their child’s class. Join us in this Dance Company event open to ALL CAPAS students ages 8+! Master classes with incredible New York professionals such as Rachel Hettinger, Greg Dolbashian, Shelly Hutchinson, JT Horenstein and Brenton Tyner-Bryan. Come see what Dance Company is all about! For more details and for non-Dance Company student registration, CLICK HERE! 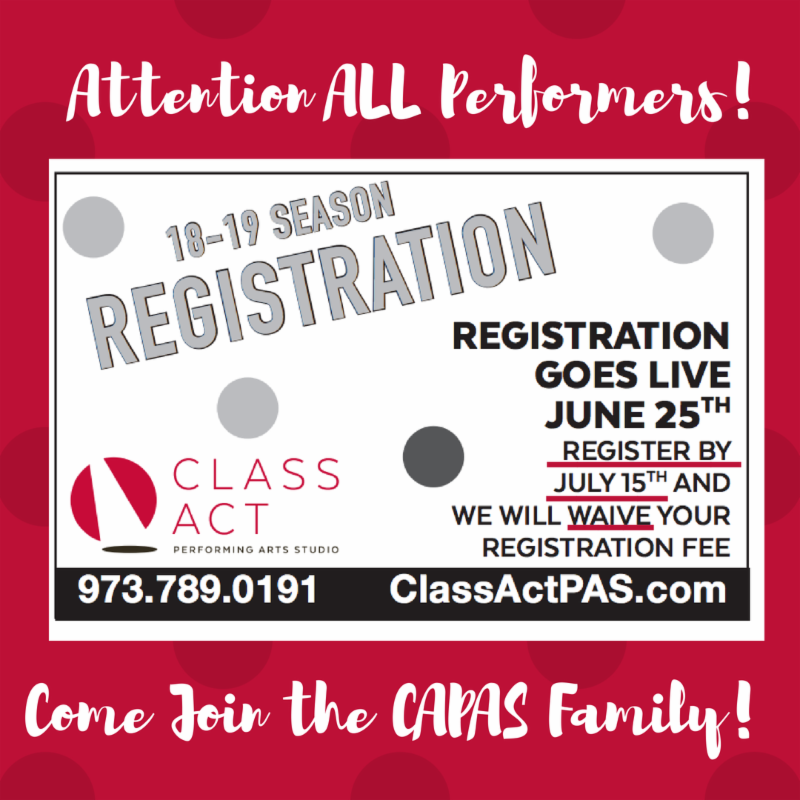 Class Act Performing Arts Studio’s 2019 Musical Theatre and Dance Company members will entertain you by performing a compilation of incredible musical theatre moments originally found in literature and film! NEW VENUE!!! Due to a complete sell out of performances last year we have upgraded our performance space to the HAMILTON STAGE located at 360 Hamilton Street in Rahway, NJ. All tickets purchased at the door day of performances are $32.50 so make sure to get your tickets early! We will be closed for Winter Break and for our Company Revue Tech Week. NO classes will be taking place at this time. See you back for the Spring Semester starting Monday, January 28th! Parents will be invited to observe the last 15 minutes of their child’s class. This form must be filled out and brought back to Class Act Performing Arts Studio on the day of the class, and handed directly to the teacher. No outside student will be allowed to participate without this form completed and handed in. Registration for 2018-2019 OPEN on June 25th! Registration is open for 2018-2019 classes starting June 25th! Register by July 15th and we will waive your registration fee! CLICK HERE to enroll by Monday, June 25th! 2018 Year End Showcase-"You Should be Dancing"
Class Act Performing Arts Studio proudly presents the 2018 Annual Showcase: You Should Be Dancing! Four different performances feature the incredible students of the 2017-2018 CAPAS Season. *Every person needs a ticketed seat to enter the theater, regardless of age!